Spray 9-inch glass pie plate with cooking spray. In medium bowl, mix Crust ingredients. Press mixture against bottom and side of pie plate. Refrigerate 10 minutes. In large bowl, beat pudding mix and milk with whisk 2 minutes. Beat in 1/4 cup of the peanut butter. Let stand 5 minutes. In small microwavable bowl, microwave 1/2 cup peanut butter uncovered on High in 15-second increments until thin enough to spread. Spread warmed peanut butter over chilled crust. Pour chocolate pudding mixture into chilled crust; spread evenly. Cover and refrigerate 3 hours. Just before serving, spread whipped topping on top of pie. In small microwavable bowl, microwave 1 tablespoon peanut butter uncovered on High in 15-second increments until thin enough to drizzle. 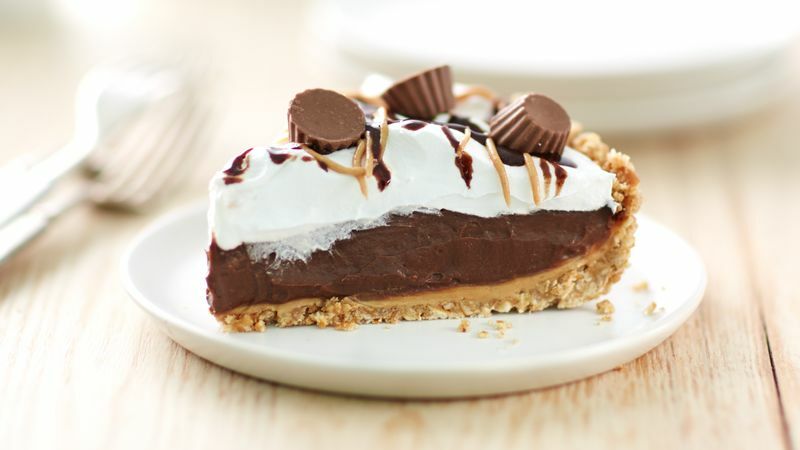 Drizzle warmed peanut butter and chocolate syrup on top of whipped topping. Top with peanut butter cups. Cover and refrigerate any remaining pie. Top with sweetened whipped cream in place of whipped topping to be truly decadent. Use bottom of measuring cup to pack crumbs firmly in pie plate.